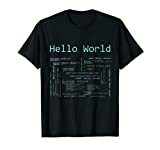 Shop for computer programming T-Shirts and clothes. This Binary Tree Computer Coding T-Shirt is the perfect gift for any nerds, geeks, computer lovers, computer science major, computer science graduate, engineer, data nerd, or even a nerdy mom or dad. Geek out with this shirt on! Tech Humor T Shirt that says "There is no cloud It's just someone else's computer". A graphic tee for the nerd in your life! If you are a geek, developer, or a software engineer then this is the shirt for you! Gift this funny tee to your professor, student or nerdy sibling. computer nerd, programming student or technology professor gamer geek. Techie nerd engineer type? Or love computer software? 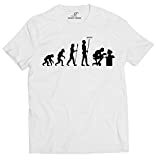 Need a Funny sarcastic tee?" Printed in the USA. 100% Cotton Black. Mens Unisex Adult Sizing. Tearaway label. Exclusive Thread Science design. If you're a fun wife looking for great birthday men's apparel ideas for a husband, a parent trying to find the perfect awesome novelty gag graphic t-shirt present for a son or daughter, or a teenager searching for fun cool vintage retro and classic clothes, we offer top quality soft touch tees and merchandise that are sarcastic, witty, old school, interesting, clever and unique. Surprise gifts for everyone; teachers, students, friends, coworkers, and neighbors. "There are 10 types of people in this world: Those who understand binary and those who don't"
This is hilarious to all of those binary lovers! Only the truest of computer programmers and coders will understand this shirt! If you write code, you need this shirt.